I know that many drinkboston readers are not above downing a watery, low-rent beer from time to time, and I’ve seen, first-hand, how many of our area’s top bartenders consistently go for the gusto of a Schlitz, Bud or PBR when their work is done (a.k.a. Miller Time). Which brings us to the recent high-profile hijacking of America’s own Anheuser-Busch by those Belgian bullies at InBev. Does it matter to you that the all-American brand is now just a piece in the portfolio of some multinational conglomerate? Pabst Blue Ribbon sure thinks it does. Recently, the folks at PBR sent out an e-mail questionnaire asking drinkers if it mattered where their beer was brewed and by whom, all the while subtly suggesting that PBR was the one and only defense against the hordes of sudsy foreign-owned invaders. Kinda silly, if you ask me. Look, we all know that in the booze world, perception can trump taste, and perception is certainly the driving force behind the lawnmower beer revival. 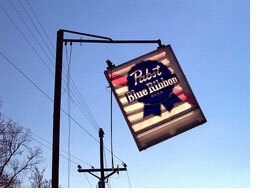 The taste differences between PBR, High Life, Schlitz, ‘Gansett, et al. are small. (Try a blind taste test. I did.) What’s large, however, is brand loyalty, or, in the case of these retro beers, anti-brand loyalty. For example, PBR became an underground hit with hipsters not because of taste but because of stealth marketing, nostalgia, and low, low prices. Oh, the perception that Pabst is some kind of kindly, mom-and-pop operation, unlike Mega-Bud, didn’t hurt either. That said, do you really know your retro beer of choice? And, do you have any idea what value-priced swills are cleverly vying for your kitschy beer dollar? Let us know how you feel about all this — that is if you’re brave enough to admit that you drink these beers in the first place. I’ve never fully understood the stigma that cheap beer has gotten. BAD tasting cheap beer I understand, but Bud and Pabst (my two cheapies of choice) just don’t taste bad. And they don’t taste like water either. No, they don’t have the “complexity” of a Duvel or a vintage Samichlaus, but when I’m hanging out by the pool, sun beating down, they sure hit the spot. Still the are some of the most obvious “junk beer” targets. In particular, I really I have to love the razzing I’ve gotten from some fools who accuse me of not drinking “real beer” right before they crack a Coors! I find it extremely humorous that there is now, within the cheap beer circles, there is a snobbery arising over the “foreign” Budweiser. Man! I wish I could find the quote, but when the announcement of the sale of AB to InBev, someone stated that they were quitting drinking Bud. Until it returned to U.S. hands, they said they would only drink Wild Turkey… a Pernod Ricard product. When I go to Redbones the bartenders Heidi and Dez don’t even ask me what I’m drinking… PBR on tap. I am a proud drinker of the stuff for most my life. I have always liked the beer. Cheap..yes bad no. I drank Peels in college it was cheap and bad… I still drink PBR. As for where it’s brewed… for me it is Sub Culture Americana: but that is nothing new… a new crop of Sub Culture people are drinking it. Narragansett was a favored local working man’s brew during my New England childhood, heavily advertised on Red Sox games, a brand that faded in the early 80s much like many blue-collar brews with a small regional following once the big national breweries revved up their TV advertising and started snapping up smaller brands. I don’t know if the new ‘Gansett qualifies, as it’s now one of those vintage brands that have been revived and reformulated by some young entrepreneurs and are now brewed outside of their original locations, but anyway. I had some of this new Narragansett on tap at an old Italian-American and seafood place (run by Portuguese-Americans) in Warren, RI called Jack’s Family Restaurant that I recently revisited after a 20-year hiatus. I had a superb meal, made better by knowing that a) the family that ran it decades ago when my folks first took me there is still in charge (we were served by the original owner’s grandaughter, and Jack is still tottering around the place at the age of 80); and b) the food is everything I remember from those days, simple and good, especially the local steamers, quahogs, oysters, and lobster. Pitchers of that beer were really delicious. I’ll have to try it again outside of the eminently nostalgic setting to see if it holds up. I’m old enough to have been watching the generational beer changes for awhile. In the ’60’s, everyone drank Schlitz (‘Ganset was for older guys), until the formula was changed in ’69, at which point everyone switched to Budweiser. (60’s styled “Classic Schlitz” is now back on the market, but hasn’t made it to MA yet). Bud’s reign continued in the ’70’s, though if you wanted to impress your date your drank Michelob (or to be really impressive, you drank the import Lowenbrau). But you could also drink Knickerbocker Natural (65Â¢ for a 16oz bottle) or a Falstaff. Coors was the stuff of legends; maybe, hopefully, someone would bring you some from the West. Old man bars still served Pickwick Ale (aka Pissquick Ale) for 35Â¢. By the mid-80’s, Rolling Rock was the hipsters beer-of-choice, with everyone at The Rat clutching green bottles. Then the microbrews appeared and a plethora of small brands began selling. By the late 90’s, it was time for the return to cheap [retro] beer. When Pat Sullivan acquired the old Windsor Tap and was about to christen it as The B-Side, he discovered cases and cases of Schlitz sitting in the basement. Those of us who worked there started drinking it as shift drinks, and customers started picking up on it. One guy was drinking it with shots of Green Chartreuse, and the “Windsor Hi-Lo” was born (and still on the menu). Next up was PBR, which it’s claimed was re-discovered in Portland, OR (I don’t believe that); musicians, etc, in Brooklyn began drinking Schaefer cans at clubs (my fave beer jingle of all time). The cheap American beer thing continues on (almost all owned by Pabst, it appears), while Anheuser-Busch scrambles to create new products to compete with the microbrews and the imports. I saw a show on the history of Budweiser last week on television, that stated that beer sales overall have plummeted to their lowest point ever, due to the rise of wine and cocktails. Maybe a return to Colt 45 or even Champale could be next. Can the Schlitz Malt Liquor bull be far behind? Wow. What binds all us liquor snobs together in one warm, happy fraternity? The fluid of our formative years: cheap beer. Our connections to PBR, Schlitz, “Gansett, Schaefer and — god, thanks for reminding me, Cleve — Rolling Rock are almost mystical. MC, I’ve had ‘Gansett in several settings (all of them non-nostalgic, since I never the drank the stuff as a youngster) and have enjoyed it each time. Cleve, speaking of the A-B strategy, I just received packages of A-B American Ale and Michelob Pale Ale in the mail (Pale Ale in the Mail: title of my first children’s book). These are fine beers. I also received a couple bottles of Bud alongside the American Ale, which I thought was interesting. A-B hasn’t fully tapped into the nostalgia market — yet. When they send me Champale in the mail, I’ll let you know. There’s nothing wrong with cheap beer in concept (I’ve enjoyed many a cheap beer outside of the US). The problem is with the mass produced cheap beer in the US. It’s made in enormous quantities and (un)flavored in such a way to appeal to the broadest swatch of the population. It’s the McDonald’s of the beverage world. It’s cheap, consistent no matter where you get it, and reminds many of their youth or otherwise has a nostalgic tie-in. A good craft beer is like BBQing your own burger at home, topping it with Tillamook aged cheddar, fresh sliced garden tomatoes, etc. It’ll come out different every time. The key for me to tolerate a cheap beer like PBR is to get two pints of a good beer, tranquilize my palate somewhat with that, then start saving money with a few tallboys of PBR. Yeah, I’m a total unrepentant beer snob. Nick, you’re not such the snob- you KNOW what the appeal of cheap beer is, you realize that it, while not being your drink of choice, is certainly palatable for what it is: “mass produced” and “consistent no matter where you get it”. My problem has always been with the people who dismiss it out of hand. They’ve never actually considered why they might not prefer it, they might NOT even NOT like it- they just feel they should denigrate it because they feel it’s dÃ©classÃ© in the haughty world-view that they aspire to be a part of. THAT’S snobbery. 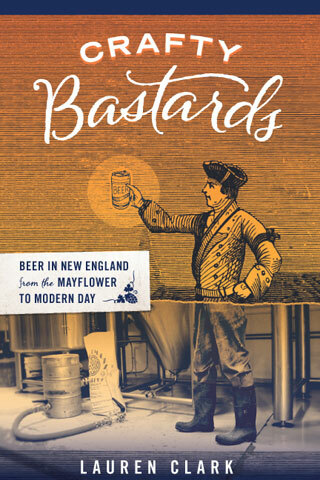 By the way, leave it to Brother Cleve to neatly sum up the history of the Boston scene (and coincidentally many other towns I’m sure) vis a vis the changing labels and bottle-colors in the hands of the masses! Simply a splendid piece of mini-socio-beer-ology! Isn’t it, though? Pissquick Ale! -my 2 cents…in the midwest it was Blatz, Oertels 92, Hudepohl, Fehr’s, Buckeye ($1.99/case! ), I’m sure there were others…most, if not all, german in origin…and most of this stuff brewed by Jim Koch’s father! if a soul had extry $$, we’d spring for the good stuff…fire-brewed Stroh’s (last I checked, STILL under $10 for a 32-pack)!…if a friend crossed the Mississippi, Coor’s was the beer of choice as it had (as Cleve pointed out) ‘legendary’ status at that point in time (early-to-mid 70’s)…and it sure tasted good on tap at the bottom of the Grand Canyon! and nobody has pointed out the Corona phase Boston hipsters went through as well (regrettably)…presently, I’m a huge fan of unfiltered beers (Long Trail has a good’un) though most do not translate well to bottles and definitely have to be quaffed via pint glass…but if I’m in a setting where ‘cheap’ beer is the only choice, I usually go with my father-in-law’s Molson Golden…get well Cleve! Ok, I feel compelled to share my little corn-water secret – not that anyone necessarily cares. From the town where I was born, Terre Haute IN of all places, comes Champagne Velvet – a beer I wish we could drink in Boston. “Sparkling as Champagne and smooth as velvet” (!) and they still use the same pre-prohibition pilsner recipe they say. It is tasty. Unfortunately you have to go to Terre Haute to get it. (JG and I have been to the brewery and it’s worth a stop, for those passing through for whatever reason!) Interesting that they are in negotiations with an Indy Belgian-beer group, as I just learned from going to their website here: http://www.cvbeer.com/index.php Hmn. Sniff. Oh! and I recommend this boilermaker: Miller HIgh Life and Belle de Brillet shot. Really. My folks were Carling’s Black Label drinkers back in the day. I also saw them bring home a few cartons of Champale (ever so classy), which if memory serves was the first modern malt liquor to be a commercial success. I didn’t really love beer as a young drinker until I spent some time in the Midwest and came across Heileman’s Old Style (then served in the stands at Wrigley), the old-formula Stroh’s, and Leinenkugel, which I recently sampled on tap at Town Docks in Meredith, NH, a little beach-shack type of place on Lake Winnepesauke (good clam roll, too). That Leinie tasted crafty enough that I suspect it has also gotten the modern ‘Gansett treatment. Champagne Velvet? Sounds like Pam Grier shoulda been drinking that in “Sheba, Baby”. I think I could use a few cans of it myself, sounds great. Pinkster, bring over a couple of 6’s and we’ll watch “Cleopatra Jones”. I love Leinenkugel. They had it on tap at a club I was DJ’ing at last year. Great with an orange slice in it. Slim, I don’t know if it’s been given the Gansett treatment, but I think not. I was in the midwest a few months ago and there are a number of variations of it available (summer ale, shandy, etc) that are starting to show up in packys here. I’m quite excited to try the Schlitz Classic Anyone going to Chicago who can grab me a 6? Cleve, Black Label is alive and well, at least at Sav-Mor liquors. I’ve been drinking PBR for a few years, especially when I go out to shows around the Boston area (PBR’s and rock guitars… you really can’t go wrong). However, I’ve noticed a disturbing trend at some premier rock bars in Boston as of late. Pretty much all over Boston a few months ago, the standard was a $3, 16oz can of PBR. Now, if I go to my local liquor store, I can pick up a 6-pack of those tall boys for around $4. Obviously there’s some markup involved selling any alcohol at any bar. It it what it is. However, I went to the Paradise for a show around the middle of June and they weren’t selling any PBR. What? That’s a little strange… I go a few months later and the tall PBR had returned… for $4. Criminal! In a cone top? Beuller? – Amtrak now offers Yeungling lagers on its trains — and charges premium beer prices for them! I am in fact drinking one right now, because it has more soul than anything else they are selling. There *is* a place for cheap beer in the universe. I’m a newbie here but am enjoying this blog — thanks! I am a lover of fine beer. The Unibroue Brewery is a gift to mankind. Sam Smith is a fond friend. Guinness, though mass produced, is a delicious and heart warming brew. Julius Echter still sends me into flights of joy and ecstasy with his fruity ways. I have had and hope to have these in the future. What PBR and Narragansett offer to me is cheap beer that tastes decent and is cheap. Did I mention cheap? I’m a grad student who loves beer, but a 4 pack of Maudite (which would probably get me as drunk as a six-pack of PBR pounders) is $9. I can almost get two six packs of PBR tall boys for that. At the end of a long day of trying desperately to get my research done, I want cold, unoffensive and alcoholic. PBR does that and does it cheaply. My love of beer has no classes, we’re one big beer loving family. I still miss Pickwick Ale. Has anyone found a beer with a similar taste?